A breathtaking and dramatic account of the JFK assassination by the NEW YORK TIMES bestselling author of CHASING LINCOLN'S KILLER! 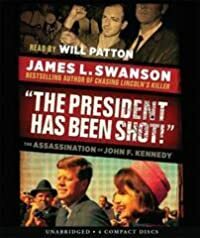 FORMAT: 4 CDs, Unabridged NARRATOR: Will Patton In his new young-adult book on the Kennedy assassination, James Swanson will transport readers back to one of the most shocking, sad, and terrifying events in American history. As he did in his bestselling Scholastic YA book, CHASING LINCOLN'S KILLER, Swanson will deploy his signature "you are there" style -- a riveting, ticking-clock pace, with an unprecedented eye for dramatic details and impeccable historical accuracy -- to tell the story of the JFK assassination as it has never been told before.